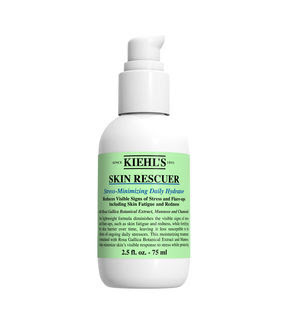 A few weeks ago, I attended the launch of Kiehl's new product - 'Skin Rescuer'. I met lots of lovely bloggers, including quite a few I hadn't met before. There was some lovely petite snacks and delicious drinks too. What is really interesting about this product is it is one of the first products on the market to help correct the visible signs of stress on your skin. According to Dr Adam Geyer, Kiehl's consulting dermatologist, skin is where the first signs of stress appear. Kiehl's scientists and doctors tell us that stress signals can cause an inflammatory skin response in the skin, causing redness, fatigue, dehyrdration and blotchiness. In the long run, it's even worse, with skin more vunerable, it can lead to premature anti ageing. Megan Rose, Louise and me at the event! What's nice about the Kiehl's products is that there really seems to be a lot of scientific and medical engagement in the development. Both PhD doctors and medical doctors are part of the team. By reading their bio's, you can tell these are really qualified people. It's great to see more science going into product development and less baseless marketing. In my opinion anyway, as someone who has a B.Sc themselves, it adds credibility to the claims. I know we can all feel stressed from time to time. Certainly, I get quite stressed when I'm doing my actuarial exams and also on business trips with early starts and plane-air. My skin can often feel dry on my face and maybe look a little tired. These combine to combat the signs of stress and make skin less vulnerable to future stress. No other product on the market is addressing stress and its effects in this way. I was given a sample to review. I decided to try it out for a few weeks before posting my review. My first impressions were good - very little scent, which I prefer, and very smooth and easy to apply. One of the things that is most important to me is how make up looks with it on your skin. This works really nicely under make up and seems to help keep it on for longer. I find after it's sunk in, there is a very slight tackiness. That word is probably even too strong. I think it helps make up to 'stick' anyway and look better at the end of the day. I think it's too much to wear this with moisturiser as well. I stuck to just using moisturiser at night and this during the day. What's great is you need to use very little so you will be able to get ages out of a full sized bottle. After using it for a few weeks, in conjunction with another Kiehl's product - Midnight Recovery Concentrate, (which I find absolutely amazing) I've found my skin is in really great shape. My dry patches are gone and even after coming out of the shower and without actually putting anything on my face, it still feels much more moisturised. I previously had some problems with dry skin, particularly around my cheeks. I feel like it is living up to the expectations about reinforcing my skin's barrier. I definitely have a new-found respect for Kiehl's as a brand. They have some amazing products and I think this could be one of them. Kiehl's have three branches, in Dundrum Town Centre, 35 Wicklow St, Dublin and inside Arnotts. Skin Rescuer will be available from all three from the 5th August at a very reasonable RRP of €35 for 75ml. I need this in my life! I am always stressed! !